Perfectly chewy, oatmeal peanut butter cookies loaded with chocolate chips! The best peanut butter chocolate chip cookies, no chilling required! Now, I try not to make claims like, “THE BEST whatever” or “THE ULTIMATE whatever”, unless I know that they absolutely are. And then I feel like it’s my duty to let you know that you can now stop looking. 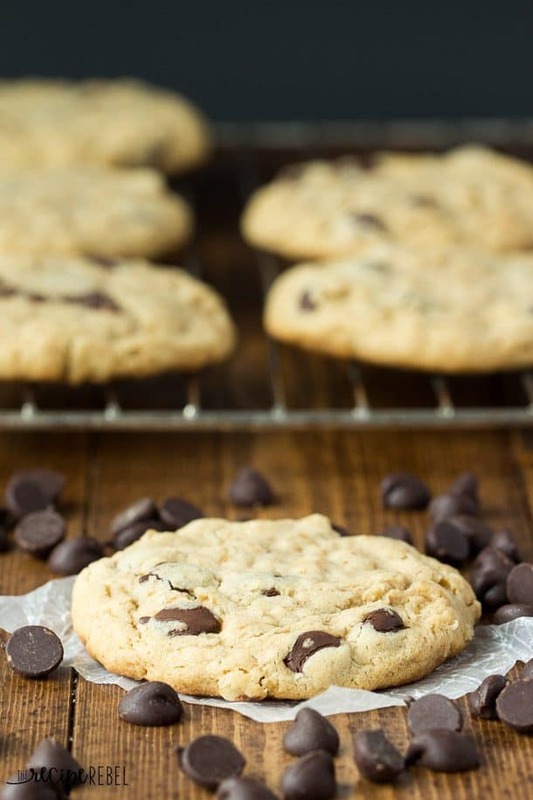 This is the last oatmeal peanut butter chocolate chip cookie recipe you’ll need. 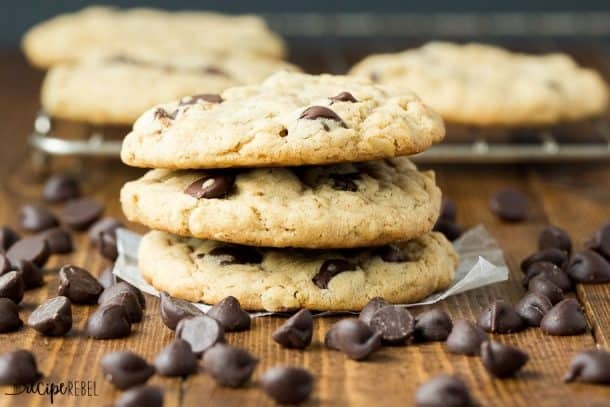 Unless you’ve never had an oatmeal peanut butter chocolate chip cookie recipe, then this is the ONLY recipe you’ll need. Are there people who don’t like oatmeal cookies? Anyone? Oatmeal cookies are one of my all-time favorites, and I’ll take them just about any way (yes, even with — gasp — raisins!). But this peanut butter chocolate chip version is by far my favorite way. This is a recipe that my mom added to her repertoire of Completely Perfect Recipes later on, after she’d perfect Oatmeal Raisin and Chocolate Chip and Double Chocolate cookies. And the recipe is one she brought home from school (where she works) one day and it quickly became a favorite. When my mom makes something over and over, you know you’ll never need another recipe for the same thing. That’s the great thing about sharing my mom’s baking recipes with you — I know that if my mom has made it the same way hundreds of times, then there’s no need to change a thing! *Note: like most oatmeal cookie recipes, you’ll want to press your cookie dough down slightly before baking to get a thinner, chewier cookie. If you don’t, they’ll still be fantastic, but they won’t sink down and get as chewy. I forgot and baked some without pressing them and they were just slightly higher and thicker. 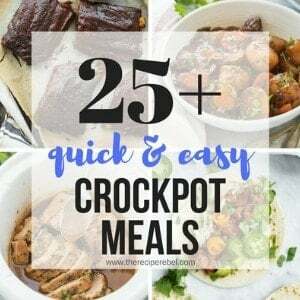 **I quadrupled this recipe (yeah, that’s right!) and got 8 dozen. I’m giving you the original measurements, which will give you about 2 dozen small cookies. 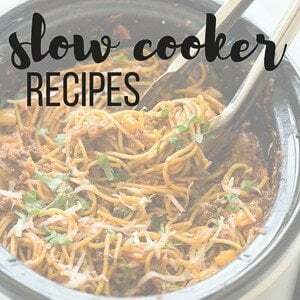 It is really easy to make a larger batch if you want to, and stock up the freezer (which is what I do with them!). 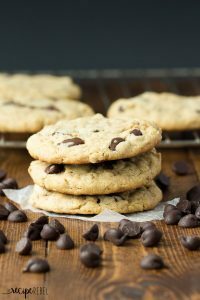 Oatmeal Peanut Butter Chocolate Chip Cookies: Perfectly chewy, oatmeal peanut butter cookies loaded with chocolate chips! The best peanut butter chocolate chip cookies, no chilling required! In the bowl of a stand mixer, or in a large bowl with an electric mixer (you can mix by hand too, it'll just take some muscle! ), combine butter, sugars and peanut butter until smooth. Beat in egg and vanilla until combined. Add flour, baking soda, salt and oats and mix until just combined (don't overmix). Stir in chocolate chips. Lightly grease 2 baking sheets or line with parchment paper. Roll cookie dough into 1" balls and place 2" apart on the baking sheet (I do 12 to one baking sheet). Press down slightly (the more you flatten them, the thinner they will end up) and bake for 8-10 minutes until just set. Remove from the oven and let cool for 10 minutes before removing to a cooling rack. I baked mine exactly 9 minutes and took them out when the centers were still slightly glossy -- I do not like overbaked cookies! They will continue to cook and set up somewhat after they are removed from the oven, so don't be afraid to take them out just before they're set completely. In the bowl of a stand mixer, or in a large bowl with an electric mixer (you can mix by hand too, it’ll just take some muscle! ), combine butter, sugars and peanut butter until smooth. Beat in egg and vanilla until combined. Add flour, baking soda, salt and oats and mix until just combined (don’t overmix). Stir in chocolate chips. Lightly grease 2 baking sheets or line with parchment paper. Roll cookie dough into 1″ balls and place 2″ apart on the baking sheet (I do 12 to one baking sheet). Press down slightly (the more you flatten them, the thinner they will end up) and bake for 8-10 minutes until just set. Remove from the oven and let cool for 10 minutes before removing to a cooling rack. I baked mine exactly 9 minutes and took them out when the centers were still [b]slightly [/b]glossy — I do not like overbaked cookies! They will continue to cook and set up somewhat after they are removed from the oven, so don’t be afraid to take them out just before they’re set completely. What is the best way to freeze and then later thaw the cookies? I just stash them in a freezer safe container and pull out as many as I need at that time. They thaw pretty quickly at room temperature — just 30 minutes should do it! But you can always defrost in the microwave if you’re in a rush. very delicious cookies. I really enjoyed them and the hint of peanut butter was great, I’m a huge peanut butter fun in baking. Delish! I added 1/4up of unsweetened shredded coconut too, just enough to give it extra texture. They turned out great and I’ll definitely make them again. Thanks! I’m glad to hear that! Thanks for leaving a comment! Made these with my kiddos and followed the recipe exactly. They were soft and chewy and delicious! I wonder if cutting back the sugar would compromise the recipe. But anyhow these are definitely in my saved recipes now! Thanks! Hi Diana! I’m so happy to hear that! You could try cutting back the sugar a bit, but I would do it gradually as it will change the texture if you cut out too much. Let me know if you try it! Thanks Tari! They are definitely a regular here! I made a quadruple batch a few months ago and just finished the last ones this week. It’s almost time for another! Made these yesterday and they were so good! I doubt I’ll ever try a different oatmeal peanutbutter recipe. I was septical by the dough of these cookies, as it appeared drier than most cookie doughs. I was so happy to find that after they were pressed and cooked they were one of the best cookies I’ve made! I made larger size cookies and cooked them 9 1/2 min. Which was perfect. They seemed under baked but ended up just right. Thanks for the recipe. I will definitely recommend it to others! So after the best chicken ever, I made the best cookies ever, thanks to your great recipes, Ashley! I made four dozen smaller cookies and added raisins (for Ken) to half of the batter. He likes them more than just the plain oatmeal raisin cookies I have traditionally made for him. 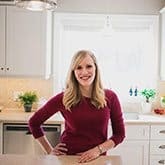 I’m so glad I found your site and will be fixing more of your delicious recipes. I’d love to buy your cookbook, if you have one. May God bless you and your beautiful family! Made these last night. Yummy!!! Even though I didn’t quadruple the recipe, I am still taking them to work today, since I have a feeling they will be pretty dangerous sitting on the counter or in the cookie jar. Thank you for sharing!! Haha, they are definitely dangerous! Thanks for letting me know how you liked them! I’ll take a triple batch of these oatmeal cookies please and thank you. Oh, me too 100%! Oatmeal all the way! I am all about the cookie! In any shape or form – these look MAGICAL Ashley! What a yummy treat to have in your freezer! HOW have I gone my whole life never having a peanut butter oatmeal chocolate chip cookie?! I’ve had oatmeal chocolate chip, but adding in peanut butter sounds even better! These really do look perfect. Can’t wait to try them! Chewy oatmeal cookies of any kind are my favorite too – yes even with raisins 🙂 These look absolutely perfect! Peanut butter and chocolate chips is such a winning combo! Love the no chilling time! If I quadrupled this recipe, I might sit there and eat ALL 8 dozen – these sound that good! Hi Ashley! These remind me of a cookie I made for an older gentleman who lived above our law office when we were in MI. I called them cop cookies – chocolate, oatmeal and peanut butter! I love peanut butter and chocolate cookies! And oatmeal cookies. In any form! Love these! I can never say no to cookies, especially if it’s loaded with chocolate. I haven’t had peanut butter cookies for a while, and I think I know what I’ll be baking tonight!! Wow. These look SO good, and I love peanut butter and chocolate and cookies all so much that I will absolutely love these. For you to say something is the best is a big deal! 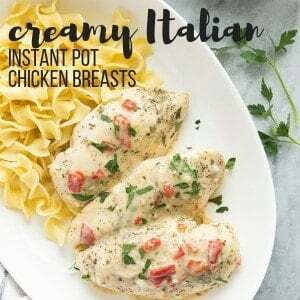 I’m all for this recipe, and cannot wait to try! Chocolate, peanut butter, oats, and your word for it being the best ever, is a definite recipe for success. Pinning! I’ve never had oatmeal peanut butter chocolate chip cookies before, seems like I need to fix that. These cookies look so good and my family would love these. I wish my mom would’ve baked cookies for me when I was growing up. These oatmeal cookies do look like the best. Love the peanut butter and chocolate chip combo. I bet they smell amazing while baking. Oh yeah these do look good and I can see why you said that they are the best. Peanut butter and chocolate always is a winning combo! I never used to be a huge fan of oatmeal cookies, but as I’ve gotten older, I love them more and more. 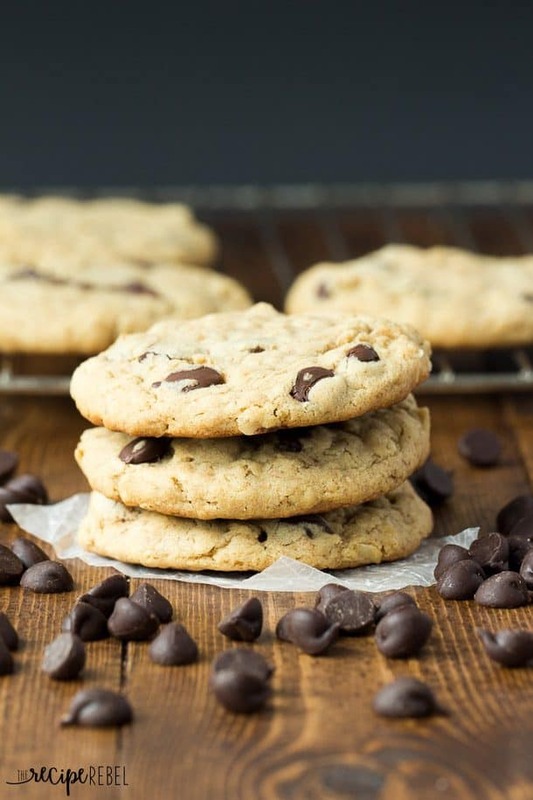 This peanut butter chocolate chip version sounds amazing! Love the delicious combo!